ក. 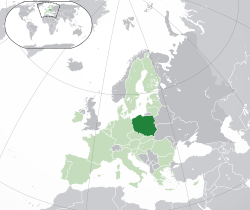 ^a The area of Poland, as given by the Central Statistical Office, is ៣១២៦៧៩ គ.ម២ (១២០៧២៦ ម៉ាយ ក. ), of which ៣១១៨៨៨ គ.ម២ (១២០៤២១ ម៉ាយ ក.) is land and ៧៩១ គ.ម២ (៣០៥ ម៉ាយ ក.) is internal water surface area. ខ. ^b The adoption of Christianity in Poland is seen by many Poles, regardless of their religious affiliation or lack thereof, as one of the most significant events in their country's history, as it was used to unify the tribes in the region.